Army Gen. Curtis Scaparrotti, also the NATO commander, said his forces need two more Aegis warships to bolster six destroyers currently deployed in Europe, along with greater intelligence and surveillance capabilities. Threats to the region are "real and growing" while "Russia remains the primary threat to a stable Euro-Atlantic security environment," Scaparrotti told the Senate Armed Services Committee. Russia under President Vladimir Putin has undertaken a large-scale military buildup since 2006 that includes new ballistic and cruise missiles, both conventional and nuclear, along with nuclear missile submarines. Putin announced recently that three new strategic weapons were being developed and fielded, including a long-range nuclear cruise missile, a nuclear-armed drone submarine, and hypersonic strike missiles. "While the United States maintains a global military superiority over Russia, evolving Russian capabilities threaten to erode our competitive military advantage, challenge our ability to operate uncontested in all domains, and diminish our ability to deter Russian aggression," he said. Russian naval forces, both warships and submarines, are expanding and Scaparrotti urged modernizing American naval forces in response. "If we want to remain dominant in the maritime domain, and particularly undersea, which we are today, we've got to continue to modernize and I think we need to build our capacity," he said. In addition to warships, new anti-submarine warfare forces are needed. Anti-submarine forces include attack submarines and anti-submarine aircraft. Eucom has 60,000 personnel from all services and civilians. NATO is made up of 29 European nations. Since 2014, U.S. forces have been added to the region to counter Russian threats, including additional prepositioned ground- and air- force weapons and equipment, and enhanced anti-submarine warfare capabilities and integrated air and missile defenses. Forward-deployed Army battle groups have been deployed in Lithuania, Latvia, Estonia, Poland, and Italy. An armored brigade combat team and combat aviation brigade also are kept ready for rapid response. Scaparrotti said in addition to new hardware, the United States needs a better strategy to confront Russian hybrid warfare—like the use of covert military forces in 2014 used to take over Ukraine's Crimean Peninsula. Russia also is stepping up disinformation and influence operations. "They have a good deal of agility and they seem to have no constraints on what they are willing to say publicly," the general said. "We need to probably get greater focus and energy into a multi-faceted strategy to counter Russia," the four-star general said. Scaparrotti said a recent speech by Russian Gen. Valery Gerasimov, chief of the general staff, urged greater "indirect" warfare operations against the West. "We have to approach this in a way that we can counter that, specifically within information operations, challenging their disinformation and cyber areas that we need to continue to press," he said. 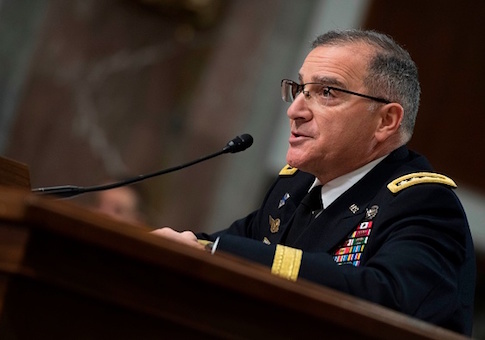 Scaparrotti also said he would recommend more rotational deployments of aircraft carrier strike groups and amphibious strike groups to Europe. Additional armored ground forces also are needed. Advanced fighters and bombers already have been dispatched for temporary deployments by the Air Force, and Scaparrotti said he is "looking forward to those being stationed permanently in some numbers within Europe." Last year, Russia conducted the largest military exercise since the Cold War called Vostok 2018 that Scaparrotti said involved practicing the large-scale movement of troops and arms and also nuclear warfighting. "It covered both conventional long-range precision munitions training, as well as nuclear training offset toward the end and it included China, which is the first time I can recall them providing forces in a partner training scenario, which is quite unusual," he said. "So the size of it, the complexity of it, the communications that they demonstrated, the fact that it was a hybrid conventional and nuclear exercise I think is all-important." Gerasimov, the Russian chief of staff, stated at a conference in Moscow that Russian military forces must counter new U.S. military strategies by employing both classical and asymmetric warfare. The military approach is called active defense and preemption. "We must be ahead of the enemy in the development of military strategy, one step ahead," Gerasimov said. The command also is bolstering cyber warfare capabilities as a priority. "We're facing Russia, who is very agile in [cyber warfare] and good at it," Scaparrotti said. "We've got a lot to do yet in cyber, particularly capacity. We have to build the skills that we need to man these centers." On the Trump administration's announced plans to withdraw from the 1987 Intermediate-range Nuclear Forces Treaty, Scaparrotti testified that the pullout has strong support from NATO. Putin announced recently that Russia, too, is leaving the treaty. "The fact is that they left the INF treaty some time ago, years ago by very deliberately producing a weapon in violation and they have been deploying that weapon," Scaparrotti said, referring to the ground-launched SSC-8 missile. Scaparrotti urged sending additional lethal aid to Ukraine, beyond the Javelin anti-tank missiles already sent. On Turkey, Scaparrotti said he and other officials have been pressing Turkey, a NATO ally, not to follow through on announced plans to purchase advanced Russian S-400 anti-missile systems. Doing so would undermine NATO air power and missile defenses, he said. The Russian defense system is not interoperable with NATO systems or continent-wide integrated missile defenses. The purchase of the S-400s by Turkey also would compromise U.S. warplane capabilities, such as the stealth characteristics of the F-35, to the Russian air defense system. The F-35 sales should be canceled if Turkey buys the system. "It presents a problem to all of our aircraft but specifically the F-35," Scaparrotti said. "My best military advice would be that we don't then follow through with the F-35 flying it or working with an ally that's working with Russian systems, particularly air defense systems, with what I would say is probably one of our most advanced technological capabilities."